The following post is written by Flipgrid Head of Educator Innovation Jornea Armant Erwin. In this series (see the full collection here) Jornea will share a unique #GridTip to help you make the most of Flipgrid! ✅ Discover the all new Flipgrid! ✅ Check out Kristin Merrill's awesome list of back-to-school Topic ideas. Let me know what you think and then share your best ideas with me on Twitter: @Savvy_Educator. Have a great semester! 🗣️ Say My Name - Our names are part of our identity, so it is important to say our students' names correctly! Learn each child's name before the start of school by creating a topic for students to share their name and what makes their name special. 🤝Meet and Greet - Face to face meet & greets with parents are great, but not everyone is able to participate or remember the information shared. By flipping your "Meet and Greet" and placing it as a Topic on your back to school Grid (use the Public / PLN Grid option), families can share a bit of their world and get to know you as well. It will introduce them to Flipgrid and let them have fun recording as a family! 👩‍🏫Who's Who? - What better way to build community than to know who is in your community! Create a District or School grid and ask all faculty and staff to introduce themselves, share their job role and their passion for what they do! This is bound to strengthen the relationships among educators and the community. Check out the inspiration from Spring Lake Park School District. Information, Forms, and FAQs - Do you have a list of forms parents need to complete or important information they need access to? 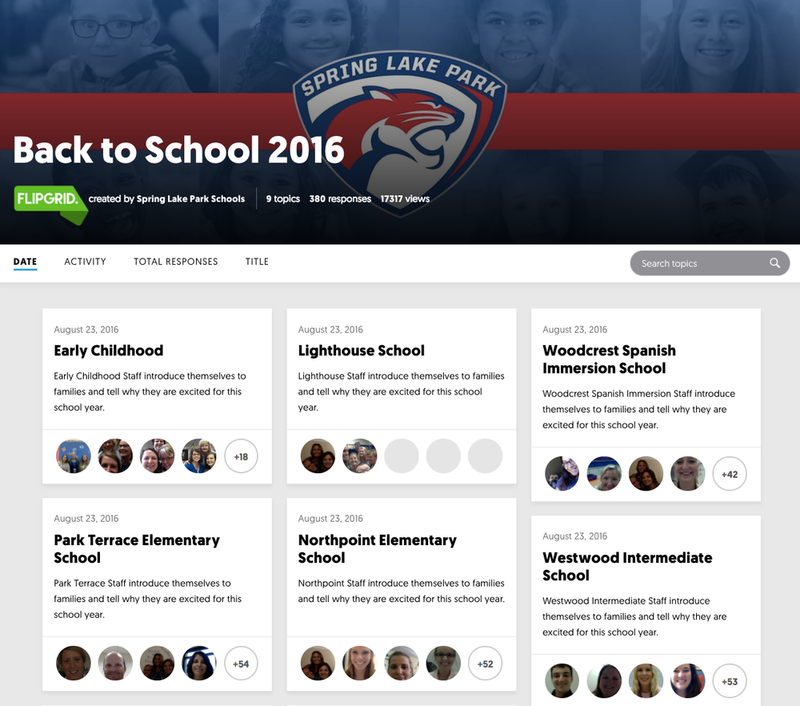 Add your form or information as topic attachments to your Welcome Back Flipgrid message to families. It serves as a great landing page to access important resources. Encourage families with questions to record a response to ask their question. It may be best to turn on "Response Moderation" and the questions you want to feature can become your school's FAQs. First Day FlipHunt Fun - Kathi Kersznowski wowed the 🌎 and the #FlipgridFever community with her amazing FlipHunt idea. And enthusiasm skyrocketed when she and Priscilla Heredia presented it at #StuVoiceCon18! Create a FlipHunt for students and families to understand school policies and procedures in a fun and creative way!